.44 Special Smith and Wesson ammunition was designed in 1907 and then first debuted in 1908. The Smith and Wesson .44 Special was ahead of the curve because it was specially designed to have a larger diameter than any of the other .30 caliber designs of the period. Since then, the Smith and Wesson .44 Special has found a solid place in various events in the cowboy action shooting genre, secured its place with wild west enthusiasts, seen use in various lever action rifles, and some target shooters truly enjoy shooting the lightly recoiling round. 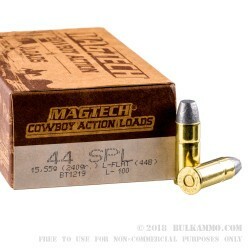 The Magtech Cowboy Action line of ammo is growing larger with the .44 Special caliber added to its ranks. 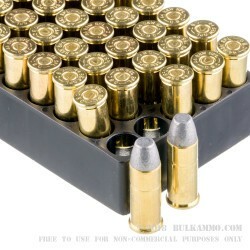 These rounds are loaded with a 240 grain, Lead Flat Nose or LFN design bullet with no jacket. 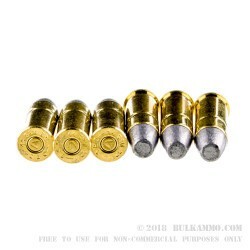 Each LFN bullet is all lead construction with each one loaded into a reloadable, new manufacture, heavy duty, Boxer primed non-corrosive, thick walled, yellow brass case. These cartridges have a respectable muzzle energy that hits at 310-foot pounds, and their muzzle velocity is a reliable subsonic 761-feet per second. These loads come in the well-known recognizable Magtech Cowboy Action, 50-round packs that are easy to stock and stack. They are simple to transport to the range, take out for plinking fun or testing a new lever action rifle platform, or, as previously stated, for any cowboy action shooter competition. Grab some today! Q: Ccan you tell me the load pressure for thes round as I have older 44 spl? A: The only information Magtech gives about this ammo is that it is standard pressure 44 Special ammo. Because it is a "Cowboy Action Load," it is likely to be lower than the maximum SAAMI pressure for 44 Special. If you are concerned about your revolver's ability to fire modern ammo, an inspection from a gunsmith might help you decide. Q: What is the head stamp on the casings of these cartridges; ie Rem, Win, etc? A: These Magtech cases have a CBC headstamp which is unique to the brass produced by/for Magtech.